The cleartarn Property Website and Rightmove System is a powerful self contained internet based content managed website and Rightmove property upload system which is controlled from any internet connected PC, tablet or phone. Each system is independent (not using shared databases or platforms) and is multi user and designed to take advantage of the latest Rightmove website and new mobile website capability, which is being widely advertised. BLM (bulk load mass) file transfer for Zoopla, newspaper advertisements etc. Includes latest increased Rightmove limits for numbers of images, floor plans, videos, file attachments etc. With a host of other new innovative features, the system integrates fully with Rightmove’s latest Real Time Data Feed, so that as soon as a property is ready to be published on your own website it can be sent to Rightmove individually or as part of a group of properties. 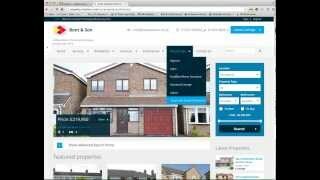 Details of properties already stored on Rightmove can be immediately changed. The new Rightmove Real Time Data Feed allows considerably more attached files and information about the property to be uploaded and Rightmove expect uploaded properties to be published on their site within minutes or receipt. The cleartarn system puts you in complete control of publishing properties to your own website and Rightmove or other property feed sites and, because the site incorporates a website content management system, you can add and change pages on your website whenever you wish. As you would expect, cleartarn provide excellent ongoing support and advice on system usage. We are so confident that you will find the system really adds value to your organisation that we will create a new site for you to test free of charge with no obligation. Just contact us and start to explore the next generation of internet property sales systems. For more information Download the property system information sheet and visit the Property System Demonstration Website. If you would like to access the administration system to try uploading properties, please contact cleartarn.